In recent years the number of tools available to help you document and design your web site has just exploded. It seems that we all need a wireframing or prototyping tool at our fingertips (at least in the design arena). So in order to save you the hard work required to find one, I’ve assembled this list. It can be expanded upon, so if you use an unlisted application, please let me know and I’ll add it to the list. Within these two groups I’ve found that usefulness can vary markedly among tools; some are only suitable for diagramming and wireframing, while others focus only on prototyping. The best are blessed with both capabilities and more. I will state upfront that I’m not a big fan of Visio (price: from $US259, demo available); I’ve used it from time to time on various projects, but I’ve always found it fiddly and time-consuming. Visio first started as an add-on to MS Word, filling the need for a business and technical diagramming tool and eventually graduating to separate product status. Visio’s power remains in the area of diagrammatical documentation; as a prototyping tool its functionality is limited at best. However Visio, like Omigraffle (below), is particularly suited to content map generation from CSV files. In the recent version, Visio 2007, the addition of the UML plugin has allowed for smoother importing of UML. Visio has also spawned a number of add-on tools; Swipr (which is free) is the most relevant as it allows for rapid export of wireframes and screen flows into a clickable HTML prototype. This is very handy for creating the entire prototype in one go and not having to link it together after exporting. Visio is only available on the Windows platform. Yes, I’m a little biased here; I do like OmniGraffle (price: $US199, demo available), especially the latest version. 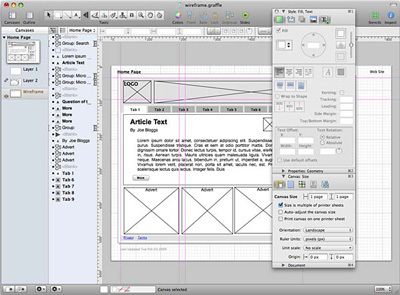 OmniGraffle is best suited as a tool for wireframes, screen flows, and content maps. It can also be used as a prototyping tool, with the ability to link canvases (pages). This allows you to produce a complete HTML prototype in one operation from OmniGraffle. You can, via the use of the notes function, easily annotate and complete the specification documentation for your prototype objects as you go. OmniGraffle provides an extensive series of Visio import and export functions, allowing for cross-platform team compatibility. It also allows you to import your base content structure from a CSV or XML file via a fully customizable rule-based layout function; this can be especially handy for documenting large and ever changing content maps. Support for OmniGraffle is supplemented by a large online community, as is evidenced by the resources available at Graffletopia. OmniGraffle is only available for the Mac. Axure (price: $US589, demo available) has rapidly become the darling of the user experience and information architecture communities. The application allows you to construct wireframe models, document functional specifications, and generate prototypes, all using a built-in version control system. Axure is an extremely rapid wireframing and prototype generation system that I’ve personally found pays for itself very quickly – in terms of increased productivity – despite its mid-level price tag. A word of caution: if you do go looking under the hood of your HTML prototype, the code it generates is not for the fainthearted and should never be considered for use beyond a testing prototype. The one downside for me is that it only runs on Windows. If it was available on the Mac, I would be very happy with Axure. iRise (price: from $US6,995, demo available) was the first product of its type to market, and has advantages and disadvantages. The iRise product suite is very Axure-like in its functionality, and as the price suggests, is clearly geared towards an enterprise-level market. Price aside, the one thing that I dislike about iRise is the user interface. Now this may be a personal preference, but you would think that if you’re going to be producing a tool for user experience professionals that you would at least make sure the UI is right. iRise suffers from a legacy interface that uses older GUI methods and techniques. I believe it’s in real need of an overhaul. Still, if you’re looking at working with very large teams and need a comprehensive suite of products to span your entire prototype development life cycle, then iRise is worth a look. Pencil (free) is a Firefox plugin that professes to enable you to build wireframes and prototypes. As a prototyping tool it’s quite good, allowing you to quickly put together a reasonably high fidelity mockup. However, be aware you’ll still need to produce the visual design elements for Pencil, as it relies on dragging and dropping pre-made graphical elements. The output wireframe elements that ship with Pencil do tend to be based on the look and feel of a Windows desktop application. This really is undesirable for a web application, however you could modify this with your own page elements. Another downside of Pencil is that its export functionality provides only a few image formats. This means that Pencil falls short of being a real interactive prototype development tool. 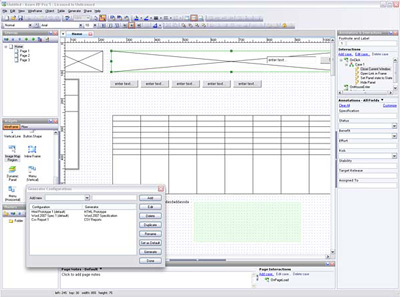 SmartDraw (price: from $US297, demo available) is marketed at the business diagramming sector, it’s not really a dedicated wireframing and prototyping application, but that doesn’t mean that it should be dismissed completely. It’s at the lower end of the market so you would expect a reduced functionality set compared to Axure. SmartDraw is aimed at the same market as Visio or OmniGraffle, with a standard template suite and few auto generation features. For prototyping SmartDraw allows you to add simple dynamic elements to a page, with the final output being a PDF file. There is no allowance for the representation of the transition between states on prototypes. SmartDraw is only available for Windows, offering a degree of MS-Office Suite integration. MockupScreens (price: from $US79, demo available) is a Windows-only application. It focuses primarily on the building of simple prototypes from a series of wireframes based around common screen elements. The prototyping functionality is limited, and only available within the MockupScreens application. I do note that you can export the screens as image files or as a very limited HTML rendering. This product is very much at the bottom end of the market in terms of cost and functionality, however this may suit your needs.